Chris Burnell, the 2019 guard out of Rockford East H.S. (Rockford, IL), has pushed forward through some tough times to earn himself opportunities to play basketball and develop his education at the Division I college level. After losing a couple family members he was very close to, Burnell decided to face the adversity head-on and honor his late brother and grandmother by making himself into one of the better guards in Illinois, and a respectful, intelligent individual off the court. Through that hard work and the perseverance, his efforts in the gym with his high school team, and competing on the travel circuit with the Illinois Stars program, Burnell has offers currently from Southern Illinois University-Edwardsville (SIU-E), Winona State, and Quincy. Over the years, Burnell has built his game up and developed into a strong player at the point position. Physically strong with a good frame, Burnell is a 6’2” / 190-pound floor general with a balanced skill-set. 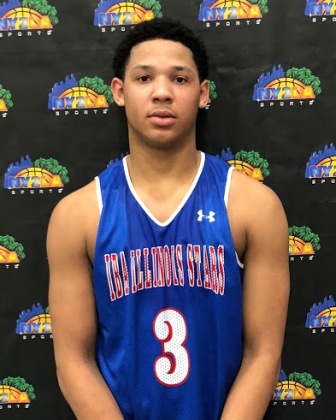 With his strength and good initial burst past defenders, the Rockford East standout did an excellent job throughout the spring and summer of showcasing his ability to keep defenses off balance with his passing and his scoring on the attack. While he continues to improve his shooting from the perimeter, he is one of the better guards in the area at scoring going to the rim, because of his physical attributes and his determination. “Finding my teammates and getting them open, getting to the basket and taking advantage of little guards, my mid-range pull-up jumper, and being a leader out on the floor, pulling out victories,” Burnell commented regarding the strengths of his game. Another aspect to his game that he is capable of taking over at any time with is his defensive abilities. When he is locked in and involved on defense, Burnell has the physical talent to lockdown opposing guards, he can battle down around the paint when needed with his strength, and reads passes well to intercept and turn the other way for fast break opportunities. With the abilities he has put on display for scouts to observe, the effort he plays with, and the heart he shows each time he is out on the floor competing, Burnell rightfully earned those scholarship offers from the three schools mentioned above. He has also garnered interest from a few other Division I schools as well with Arkansas-Little Rock, Northern Illinois (NIU), North Dakota State, and UW-Green Bay keeping an eye on the talented senior point guard. Rockford East H.S. will be led by Burnell into the season kicking off December 5, 2018 at home in a conference game against Boylan Catholic.